Here’s an idea using the Harmonic Major scale’s third mode. The formula for that is: 1 b2 b3 b4 5 b6 b7, which might be better spelt: 1 b9 #9 3 5 b13 b7. It works in the same way that the altered scale works, but it has a natural 5th. And so I usually call it, ‘altered natural fifth’. It’s not very catchy, is it? I guess that’s why you get blank looks when you mention Harmonic Major. Anyway, the people don’t hear the names, so you can call it ‘Vertical Decimator Scale of Porridge’, if your heart desires it. In these here examples from the notebook picture, I’m focussing on two triads contained within the scale, those being E minor and F minor. 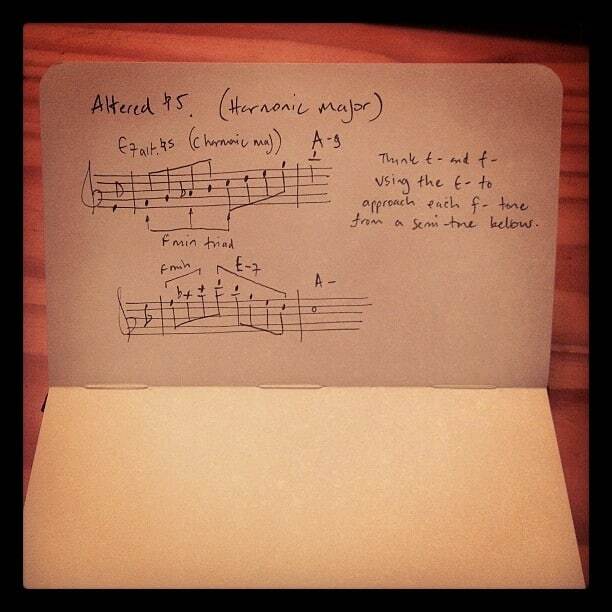 In the first example, I’ve used the E minor triad to approach each of the notes of F minor. In the second example, I’ve separated the triads; first you hear the F minor, then the E minor. All this works over an E7alt (nat 5th), resolving to A-9.